The use of parody, absurdity and sheer, carnivalesque theatricality both celebrate and make evident the fictions created by neo-narrational artists. Another favoured technique, however, involves the blurring of distinctions between fiction and reality, often achieved through the use of formats associated with the distribution of knowledge and information. Of these, the filmed documentary exerts a particular appeal. Rapidly emerging Dutch artist Renzo Martens creates work that closely resembles genuine TV documentary. Shot in 'troubled' regions such as Chechnya or Africa, the artist employs formulaic techniques - interviews, hard-hitting footage, a profusion of commentary - to survey human hardship and despair. Yet Marten's own role as narrator is far from predictable. He veers, for example, from earnestness to buffoonery, singing nonchalantly while filming ("If Bono and Madonna sing songs to help Africa, I can do the same thing"), or asking bemused locals how they perceive him rather than showing interest in their plights. His actions expose the mechanics of the disaster-fixated documentary, questioning an apparent engagement with misery which actually masks a cool detachment. The documentary-maker's incessant focus on human despair is, after all, motivated by the commercial requirements of TV, the documentary format's 'investigative' tropes pandering to audience demands for the ever more sensational. In Martens' own words: "If ... people desperately want to be seen because their life depends on it, it's utterly useless to ask them how they feel...."
In keeping with this critique, Martens also adopts the role of counsellor and activist, his interventions ranging from the acceptably benign to the far more polemical. 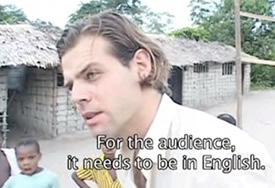 In Episode III, a feature-length work filmed in the Congo, he provides a hungry family with a hearty meal as he interviews them in their home. 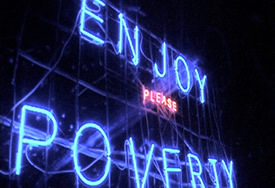 More controversially, he installs a neon sign reading 'Enjoy Poverty' in a village rife with famine. Disturbing in its apparent levity, Marten's text is to be read as a blistering indictment of audience appetites for harrowing reality, demands that verge on ghoulish enjoyment. It also underlines the artist's insistence that the only hope for those affected by disaster is to turn the tables on their exploiters. He advises the starving villagers to sell photographs of their dead and dying to prevent foreign photo-journalists profiting from their hardship. 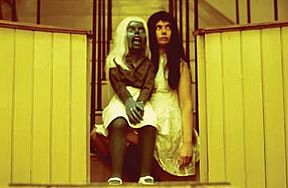 Just as Martens' hard-hitting practice gains much of its power from the authority associated with documentary, Lindsay Seers likewise uses aspects of the genre to bestow credibility on an otherwise incredible story: apparent accounts of her early life and subsequent phases of artistic development. Film, installation and texts relate the fact that as a child she was mute: a situation, we learn, that was probably influenced by her possession of a genuinely photographic memory. When, at the age of eight, she eventually uttered her first words, her extraordinary ability to recollect began to fade, prompting the artist quite literally to turn herself into a camera by inserting light-sensitive paper into her mouth and using her lips as aperture and shutter. She saw this act as a kind of ventriloquism, a notion explored through the development of various alter-egos, including 'Sailor Bill', a two-headed, animatronic ventriloquist dummy whose mouth snaps open to photograph those in his vicinity. Finally, the artist gave up her life as a camera to concentrate instead on 'becoming' a projector. The extraordinary nature of Seers' 'auto-biography' is substantiated, documentary style, by a plethora of apparently genuine sources such as interviews with her mother and a psychologist. Various artifacts - some clearly art objects, others less obviously so - further develop and support the artist's story. In a recent show, a short book detailing a search for Seers' lost half-sister was distributed to gallery-goers. Ostensibly written by an M. Anthony Penwill, the author's identity - as well as that of the artist's half-sister - may or may not be a fiction. Seers' richly diverse use of narrators and narrative devices extends, like the work of most neo-narrationists, across a wide array of mediums. Most startling, however, is her very direct correlation of image with word, the photographs emerging from her mouth a soundless utterance that contributes unique form to a plethora of distinctive voices.